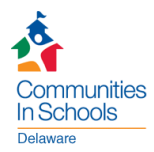 Donate to: Communities In Schools of Delaware, Inc. If you need additional information visit http://www.cisdelaware.org or contact our State Office. ​We are an 501(c) 3 Non Profit Status. In our community we know that to improve the performance of our lowest performing students, we need to address poverty. A child with a toothache is not going to care about math. A child who is hungry does not care about history. The best teachers and most gifted school leaders cannot eliminate this pain or alleviate the hunger. Yet the solution exists in communities across this country.